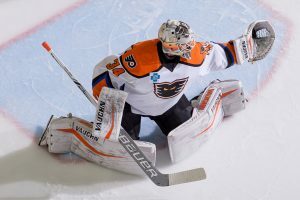 Eastern Conference Finals Now Shifts to Lehigh Valley for Game 3 Wednesday May 20, 2018 Toronto, Canada – Alex Lyon turned in a sensational 44-save performance between the pipes for the Lehigh Valley Phantoms Sunday evening but it was Miro Aaltonen’s (4th) conversion 10:59 into overtime that capped a fast-paced, thrilling 3-2 decision in favor of the Toronto Marlies in Game 2 of the Eastern Conference Finals. Toronto now leads the best-of-seven series two games to none. The series will now shift to PPL Center in downtown Allentown for Games 3, 4 and 5 this week. The Eastern Conference Finals resumes with Game 3 this Wednesday, May 23 at 7:05 p.m. where the Phantoms will look to use their home-ice advantage to trim Toronto’s series lead in half. Tickets for Wednesday’s highly-anticipated Game 3 are available now by clicking HERE. Tickets for all three games at PPL Center this week are available now by clicking HERE. 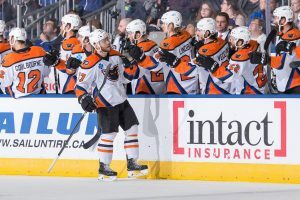 Mark Friedman (2nd) and Mikhail Vorobyev (1st) scored in regulation for the Phantoms as Lehigh Valley moved to 7-4 overall during the 2018 Calder Cup Playoffs. The Phantoms are now 2-1 in overtime games this postseason and 4-3 in road playoff tilts. Lyon’s 44-save effort was his third 40-plus save performance in these playoffs as the second-year netminder has posted a stunning 1.84 goals-against average coupled with a stellar 0.949 save percentage across nine playoff games this year. Sunday’s game was skated in front of a crowd of 7,657 fans inside Ricoh Coliseum where the Marlies are a perfect 7-0 this postseason. The Phantoms opened the scoring less than eight minutes into the contest when a two-on-one between Danick Martel and Friedman resulted in Friedman’s second goal of the playoffs. Martel and T.J. Brennan assisted on the even-strength strike netted 7:54 into the opening frame as Lehigh Valley landed the game’s opening conversion for the sixth time in 11 postseason outings. 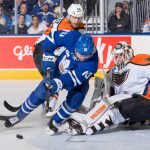 The Marlies were able to level the contest though less than two minutes later when, while on the power play, Calle Rosen’s snap shot from the high slot was redirected by Trevor Moore atop the goal crease for Moore’s fourth tally of the playoffs. Rosen grabbed the primary assist while Chris Mueller collected the secondary helper on the man-advantage marker netted 9:34 into the first period. After a scoreless second period, Lehigh Valley broke the 1-1 tie early in the third period when a loose puck in the slot landed on the stick of Vorobyev who promptly snapped home his first career AHL playoff goal. The unassisted, five-on-five strike came 5:12 into the final frame of regulation. 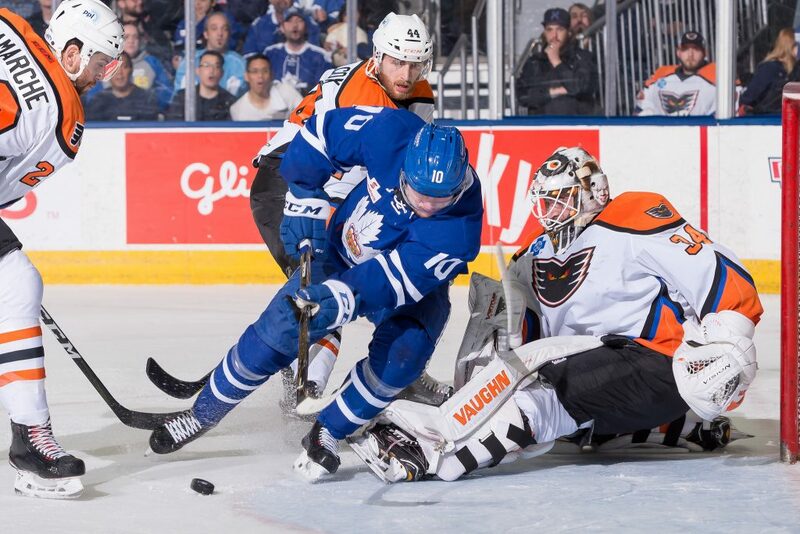 Toronto responded quickly though as the Marlies were able to level the contest just 23 seconds later when a missed opportunity by the Phantoms in the Toronto end produced an odd-man rush the other way resulting in Carl Grundstrom’s fifth goal of the postseason. The unassisted, five-on-five tally was converted 5:35 into the third frame. 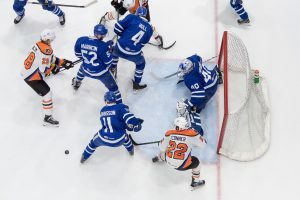 The Marlies then landed the game’s final conversion just past the midway point of overtime when a centering pass from Andreas Johnsson connected with Aaltonen atop the goal crease who was able to land his third goal of the series and fourth this postseason. Rosen garnered the secondary assist on the game-winning marker netted 10:59 into overtime. In the midst of the club’s 12th postseason appearance in franchise history, the Phantoms have captured two Calder Cup Championships (1998, 2005) and carry a 75-56 overall mark in 131 career AHL postseason outings. This is the fifth regular season division title in franchise history and the team’s first since arriving in the Lehigh Valley. Playoff strips, 10-game flex packs, and single game tickets to the 2018 Calder Cup Playoffs are on sale now! Be here for every home playoff game in your same great seats with the Playoff strip and receive a FREE Official Orange Out Phantoms Playoff T-Shirt with each seat. The “pay as we play” option offers a convenient payment plan and the largest discount on tickets. Flex packs give fans the flexibility of selecting the games and number of tickets they want. For more information on Phantoms playoff packages, contact the Phantoms office at 610-224-GOAL . The Phantoms are once again be hosting an Orange Out during each home playoff home this season. Fans are encouraged to wear orange to each and every postseason game at PPL Center as we create the best and most exciting home-ice advantage in the league. The post Fast-Paced, Thrilling Game 2 Goes to Marlies in OT appeared first on Lehigh Valley Phantoms.